These vintage postcards and related graphics concern a variety of subjects that have made a significant impact on my life. They may be about objects, such as the railroad, or places I've visited or lived. I previously posted photos taken during an auto trip to Los Angeles from my home in the Bronx, NY, in 1955. You can find those at Little Roy's Adventures. The first real adventure of my life occurred in 1953 when my mother took me by train from NYC to Chicago (via the New York Central Railroad), and from Chicago to Los Angeles on the Santa Fe Railroad, to visit my grandmother who was living in Pacific Ocean Park, between Santa Monica and Venice, CA. After a long stopover in a very hot Chicago, we took the Santa Fe's El Capitan, an amazing adventure for a child, especially in the days of black and white TV, as the train traveled through the gorgeous and colorful desert vistas of the Southwest to California. Remember those were the days when tales of cowboys and Indians were one of the most popular subjects on TV and in movies, and it was a breathtaking experience for me to see the real west come to life. What made it even more thrilling was that the trainmen on the El Capitan gathered up all the kids to tell stories about what had happened in the places we were viewing as the train traveled through New Mexico, Arizona and eventually California. At the same time I fell in love with the mystique of the Santa Fe RR and its beautifully designed red and yellow engines. And since I spent the summers of 1953 and 1955 in Santa Monica and got to see Los Angeles and Hollywood before the advent of the freeways, I've always felt a close attachment to that area which was made even stronger by the move after the 1957 season of my favorite baseball team, the Dodgers, to LA. In 1968, I moved to the Washington, DC, area to work for the federal government and I lived in Alexandria and Arlington, VA, for 13 years. During that time, another significant event in my life drew me towards the west. In 1970, my brother and his family (and not long afterwards my parents) moved to Albuquerque, NM. The following year I started to visit New Mexico and became attracted to the beautiful scenery, and the Indian and Hispanic culture. I had been on the most famous highway in America, Route 66, when it was still in business in 1955 and this added to my growing interest in the Southwest. In documenting the beauty of these things and places, I've gathered a collection of vintage postcards that are mini-works of art and much more than simply photographs of the things and places represented on the cards. This and the following pages include postcards and some graphics of the Santa Fe Railroad, the Indians of the Southwest, and the scenery of New Mexico, followed by postcards of Washington, DC, and some other important places in my life. When the postcard has been postally used, in most cases I've also included images of the back of the card to show the message, date and postage. While the odds are extremely high that the people addressed are no longer at the addresses on the cards, out of an abundance of caution, I have removed the street addresses or names. 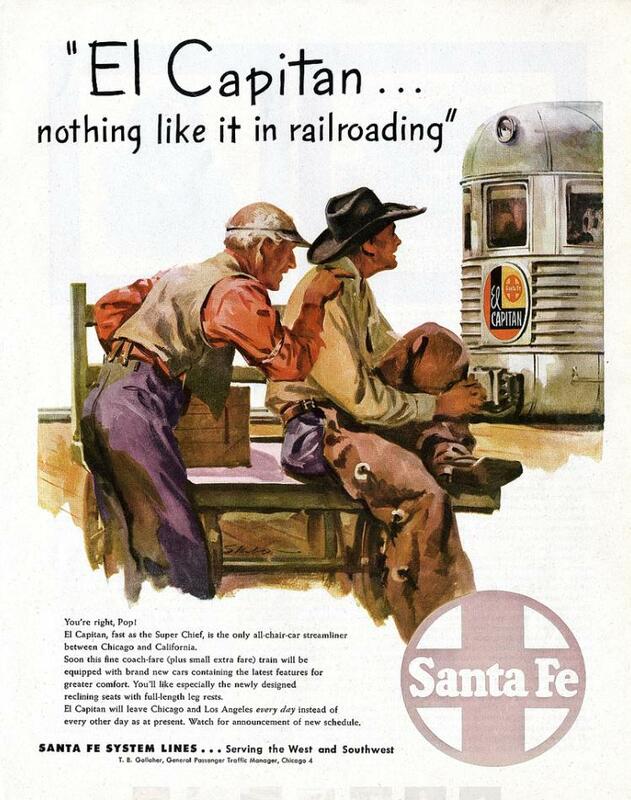 From Santa Fe RR brochures, the El Capitan in the Albuquerque station and an El Capitan magazine ad. The Albuquerque Santa Fe RR station and the Fred Harvey Alvarado Hotel. 1920s or 1930s. 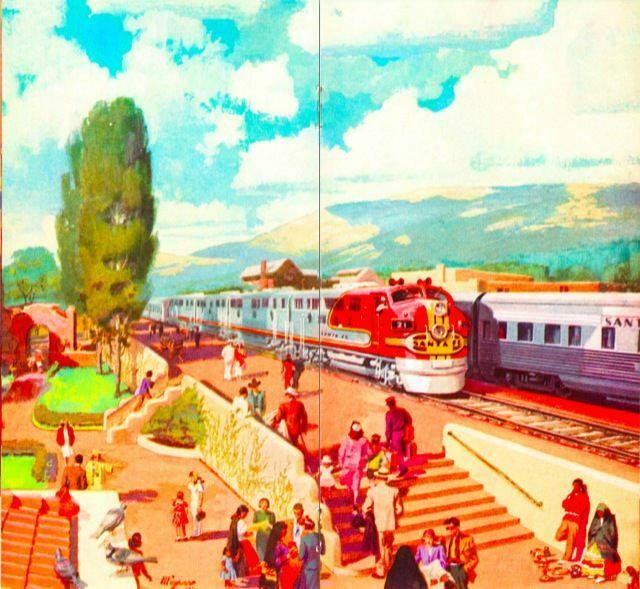 This is an interesting postcard because it shows the Santa Fe RR not long after the beginning of the 20th Century. This card, as seen below, is postmarked January 25, 1915, one hundred years ago. Although the stamp either was removed or fell off, and the writing, in pencil, is a little difficult to read, the postmark is quite clear: Fresno, CA, January 25, 1915.